Developed by Farriers for Farriers! 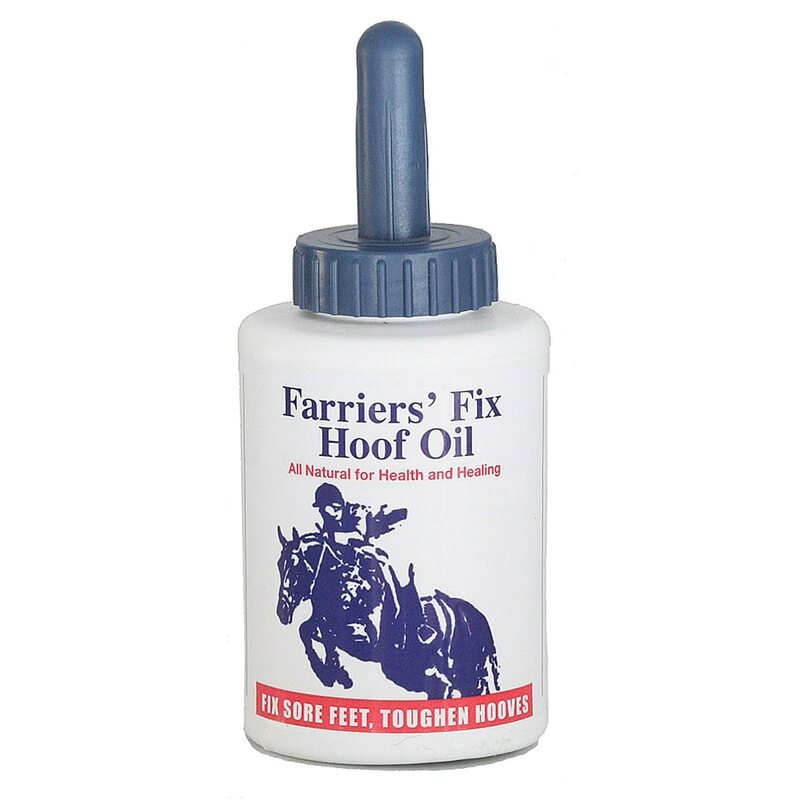 Apply Farrier's Fix Hoof Oil to clean and dry hoof exterior, sole and frog every day. Allow 5-10 minutes for hoof to absorb oil before returning to stall. 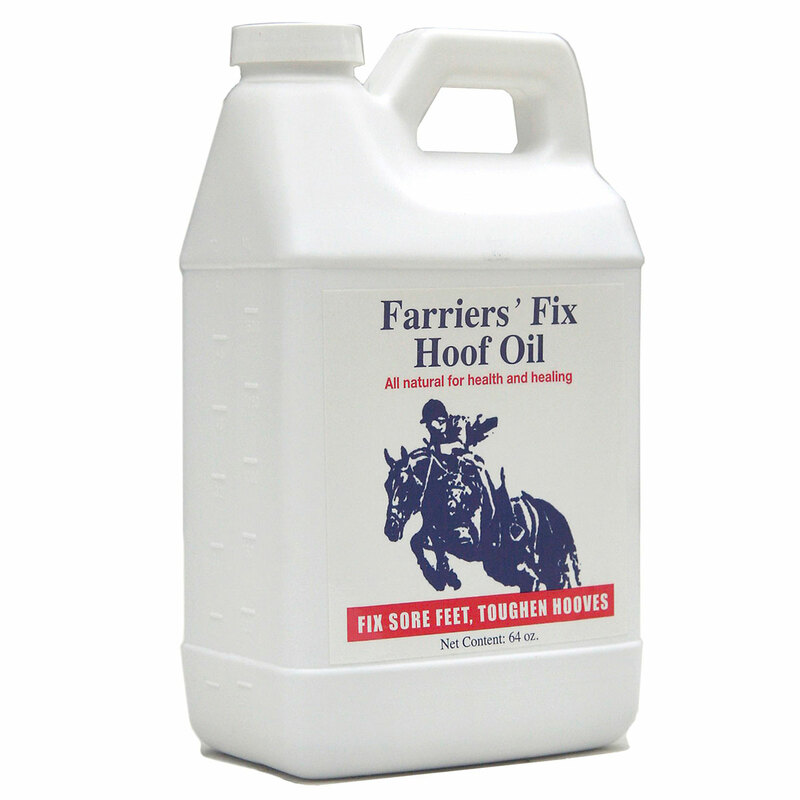 Farriers' Fix Hoof Oil is rated 4.9 out of 5 by 151. Rated 5 out of 5 by sloper from I stopped buying anything else. This has really helped my thin-soled warmblood. I think the wintergreen has an analgesic effect because my horse picks up his feet on his own when I pull this out and he's a little sore. It's also nicer to deal with than plain turpentine. Goes on easier and doesn't get thick in the winter. I like the wintergreen smell, but it is pretty intense. Rated 5 out of 5 by Be Irish from Seems like a quality product - nice ingredients It was just what I was looking for ... something to coat hooves before bathing. Smells nice too. Rated 5 out of 5 by Britchick from Excellent product You get what you pay for it that’s simple. Don’t waste your time on trying all the cheaper stuff just go straight to this . It works and if you use it correctly you can make it last a while . Rated 5 out of 5 by Bree from Best out there Love this product! Works so well and recommended by my farier and trainer too! Smells so good! Rated 5 out of 5 by Dee Dee from Awsome stuff This product was recommended to me by my farrier in TN due to my horses soft feet from founder we have since moved back to FL and needed something again and had remembered how great this product worked it’s just right you can paint it all over the hoof and get results. It does take time but it will work after two weeks his back hooves have grown out beautifully his front are damaged so it takes a bit longer to see results on those but he is able to be without boots on in stall more often. Can’t go wrong with this product and it smells good too. Rated 5 out of 5 by Kathy from Wonderful Product! This product is amazing. For sore hooves, the horse would just totally relax as I applied it, you could tell it felt good on the horse. I love the product because it also is great for thrush, paint it right onto the frog and into the grooves! Definitely will be buying more. Rated 5 out of 5 by Espia from Seems to be working Since my horse is living in an environment where there's no extremely hard ground, we decided to try him barefoot in front, as well as back (hind feet have never been shod). His hooves are generally very healthy, but we wanted to give him a good start without shoes and an equine vet tech recommended Farriers' Fix. It seems to be working. There's been just a little chipping on the edges of the hoof walls, but no cracking or flaking, and I expect that after the next trim, his front hooves should look as great as his back hooves if we stick to our Farriers' Fix protocol. Rated 5 out of 5 by Sydney Willard from Favorite hoof oil! I have tried so many different oils on my old lease horse and none of them worked until I found Farriers Fix and decided to give it a try. My old lease horse’s hooves have no more cracks and are really healthy!